Bring out those basic suits in your closet and make them pop with some new fancy looking french cuff dress shirt sets by George. George knows all about maximum visuals and exploits the style by creating unique style french cuff shirt and tie sets that a fashion minded man will appreciate. 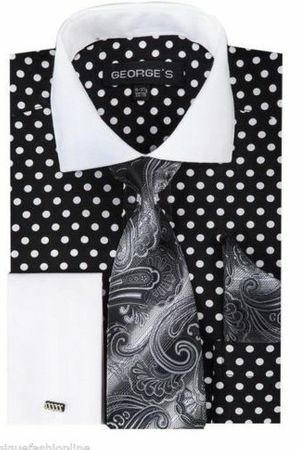 This eye catching black and white polka dot French Cuff Dress shirt and tie set comes exactly how you see it with the Tie set. Fabric is All Cotton .